The Nissan Versa was introduced to the U.S. market in 2006. 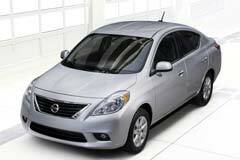 The Versa has successfully combined great fuel economy and an inexpensive price to attract a wide variety of customers. This four door economy car has a quality build and a spacious interior. The first models of the Versa (2006-2007) were equipped with a four cylinder engine that produced 122 horsepower. Customers had the choice of multiple trims, with the SL being the more upscale version. In 2009, the Versa sedan came standard with the a four speed automatic transmission. The hatchback version came with a continous variable transmission standard. 2009 also saw Nissan add even more inexpensive versions of the Versa to the lineup. The four speed automatic transmission was optional, while the manual was standard. Although these models are fairly basic, they may prove a good choice for an entry level vehicle or a second car. Customers in the market for a used Nissan Versa will be pleasantly surprised by its spacious and comfortable cabin. Buyers should note that antilock brakes were optional until 2010 on the Versa. However, the older models provide quite a comfortable ride at a very affordable price. 2017 Versa -- 2017 Nissan Versa Sedan 46770 Miles Cayenne Red 4dr Car Regular Unleaded I-4 1.